Earlier this week I covered the basics of Leading Hotels of the World’s Leaders Club loyalty program, and today I wanted to cover another popular non-points-based hotel loyalty program, Kimpton’s InTouch. Kimpton is a growing and increasingly popular US-based chain of chic, city-based hotels that does a good job at mixing business and leisure amenities and has popular perks like offering complimentary Wine Hour from 5-6pm at every hotel. It’s also a famously pet-friendly brand, which I look forward to checking out soon. Overall it’s got 60 hotels in 24 cities. Rather than basic awards on the number of stays, InTouch offers benefits such as free WiFi, member parties and free nights based on the number of eligible stays or nights. Member sign-up is free and can be done here in about five seconds. Just provide your email address and create a password then fill in your information. Kimpton offers two membership levels: InTouch and Inner Circle. 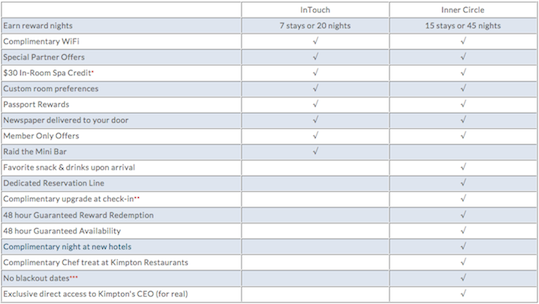 -Eligibility: InTouch at 7 stays or 20 nights, Inner Circle at 15 stays or 45 nights within a calendar year. The chart above is a bit misleadine because the qualification is listed under the Reward Night category, almost making it seem like you need to stay that many nights for a free award. However, both levels earn a free night at 7 stays/20 nights. Stays are only eligible if booked by one of the four following ways: through KimptonHotels.com; 1-800-Klimpton; InTouch Service Desk 888-695-4678 or 506-637-3376; or using your InTouch Member Number. Stays are deemed ineligible when booked on third-party websites (Priceline, Orbitz, etc. ); using a complimentary night reward; or with special rates for airline crew members, travel agents and Kimpton employees. To match your current hotel status to Kimpton, take a screenshot and attach your current statement in an email asking for a match to: GuestLoyalty@KimptonGroup.com. Per this FlyerTalk thread, it looks like my Starwood Platinum will get matched to Inner Circle. It also appears most other major hotel chain statuses should work for a match. Feel free to comment with your experience. A few of the above perks require a bit more explanation to fully understand what you’re getting. Eligible stays and nights toward earning a complimentary night reward rollover year to year, but earning Inner Circle status and Passport Rewards are based on eligible stays with a calendar year – there is no accumulation year to year – sort of like your average points-based chain. A Passport Reward, which is an additional two-night complimentary stay, is earned when members stay at 10 or more different Kimpton hotels during a calendar year. Raiding the mini bar simply means a $10 discount off mini bar treats (I know, you thought it meant you could literally consume any and everything like Intercontinental’s Royal Ambassador). Take an extra $5 off your mini bar tab when in NYC. Wondering why Inner Circle members are excluded from the mini bar concession? As it turns out, top elites have no need to raid the bar since at least two of their favorite snacks or drinks will be delivered to their room upon check-in. Kimpton even promises to hunt down a favorite brand when possible. The more information you share about your preferences, the better equipped they are to help. Kimpton’s “exclusive” and “member only” offers mean that the hotel will email members special rates throughout the year that are not offered to non-members. For example, Inner Circle members can currently take advantage of a complimentary one-night stay through December 30, 2013 that includes a $50 dining credit. Options are: Canary Hotel, Santa Barbara; RiverPlace Hotel, Portland; Donovan House, Washington, D.C.; Monaco Philadelphia; Hotel La Jolla; and Palomar Phoenix. Spontaneity sometimes pays off and for Kimpton members, last minute deals at Kimpton hotels across the country are offered weekly, with some rates dipping below $100. Two fine print details could be deal breakers for some, as the rooms must be paid for in advance and are non-refundable. Other getaway offers for members roll out every month, from San Diego to Philadelphia. Kimpton is also known for their extraordinary customer service, including making note of guests’ preferences, including whether they read the New York Times or the Washington Post, what type of pillow support they need for a good night’s sleep, and if they’ll be practicing their downward-facing dog, thus requiring a yoga mat. Members also have access to a dedicated service desk, where Kimpton “pros” are trained to “spring into action” upon request when you call 888-695-4678 or 506-637-3376. To stay competitive, Kimpton also offers status matches, where hotels match your status should you have attained premium or elite elsewhere. Just email a copy of your credentials to GuestLoyalty@KimptonGroup.com. For the fine print, read Kimpton’s membership terms and conditions here. As a new dog-owner, I’m paying more and more attention to pet policies at hotels, and here’s an area where Kimpton really excels. Kimpton’s stance is: “We welcome any pet, regardless of size, weight, or breed for zero fees or deposits at every Kimpton Hotel.” Pets also get cozy loaner beds from the hotel, food and water bowls, fresh water and lobby snacks, a personal greeting from management (Miles is especially excited about this), a concierge-curated list of local pet-friendly attractions and businesses, and there’s even a director of pet relations at select locations (which sounds like a pretty awesome job). Although Kimpton’s footprint is rather limited with properties just in the US, I hear great things about the brand and because of Miles, I think I’ll be giving it a try this year to test out the perks. Any of you familiar with the InTouch program? What are your likes and dislikes?